Van Gogh produced several versions of The Sower, a motif derived from his admiration for the work of the Barbizon painter Jean-François Millet who presents his subject with gritty realism striding purposefully across the endless tilth. Vincent never saw the original painting but knew it through the many graphic versions produced by Millet. 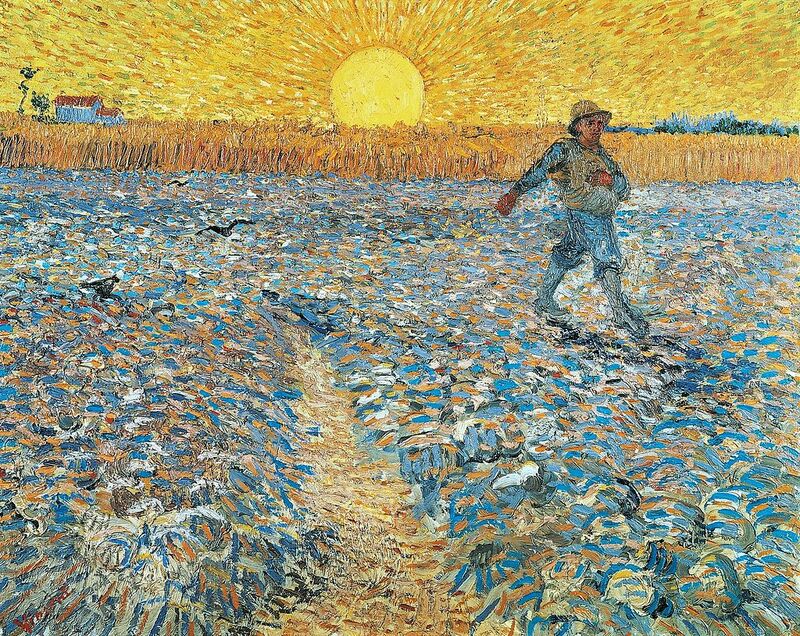 The image of the peasant labourer was very important for van Gogh, chiming with his socialist principles; but for him, the sower also symbolised the never-changing cycle of the agricultural year and the honest labour of the peasant which enabled the cycle to continue. Van Gogh took the stance of Millet’s peasant – right arm extended in the act of scattering the seed, right leg stepping forward ready for the next broadcast – and used it for more than 30 drawings and paintings. Here the labourer steps out across a violet, blue and gold field, the high horizon emphasising the emptiness of the foreground and the amount of work to be undertaken as the day wanes. The gold, yellow and apple green divisionist strokes of the tightly constrained pulsating sky explode from the huge yellow sun-disc as if they are endowed with their own kinetic energy. It forms an extraordinary scintillating frieze above the expanse of the flat land. Van Gogh has used some techniques which hark back to his time in Paris when he was befriended by Signac and other neo-impressionists but he does not slavishly follow the colour theory behind neo-impressionism. He uses divisionist dashes with mesmerising effect in both the sun-drenched sky and in the field but only uses complementary colours in the latter. For him, his choice of colour was a function of his emotional engagement.